Crispy ladyfingers with tangy, spicy masala airfried. Goes great as a munchie or side dish in your meal. Wash and dry the ladyfinger. Cut them lengthwise into thin slivers and keep aside. Mix all the dry masalas together along with chickpea flour. Generously pour it over the cut bhindi and mix well to coat all the bhindi. Now pour the oil on top and mix again. Leave it aside for about 15-20 minutes. You will see that the masala has adhered to the bhindi after this marination time. Preheat your airfryer to 160 degrees for 6 minutes. Now brush oil on your airfryer basket and put in the masala bhindi in it. Airfry for about 10 minutes on 160 degrees. Then increase the temperature to 180 degrees and fry for about 5 minutes till the bhindi are well cooked and crispy brown. Take them out on a plate and rest for about 2 minutes. Now serve your kurkuri bhindi. They are delightfully crunchy, tasty and guilt free. If you don't have an airfryer, just deep fry in hot oil. 1. Deep fry in hot oil if you don't have an Airfryer. 2. Cut bhindi in thin slivers to ensure fast and even cooking. 3. Vary the masalas as per your taste. Example if you like less heat, skip the chilly powder and pepper or reduce their quantities. 4. It is important to cook the bhindi on lower temperature first so that they are cooked well and then crank up the temperature to brown them. 5. 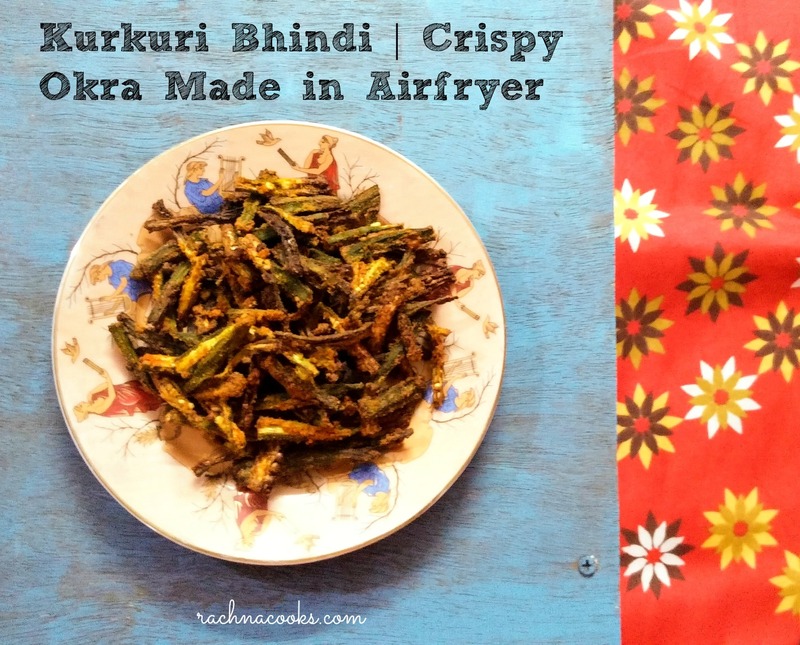 Keep turning the bhindi around in the Airfryer so that all of them get evenly cooked.